Summary: "When her widowed father dumps 16-year-old Katy Jessevar in a boarding school in Whitfield, Massachusetts, she has no idea that fate has just opened the door to both her future and her past. Nearly everyone in Whitfield is a witch, as is Katy herself, although she has struggled all her life to hide her unusual talents. Stuck at a boarding school where her fellow studens seem to despise her, Katy soon discovers that Whitfield is the place where her mother commited suicide under mysterious circumstances when Katy was just a small child. With dark forces converging on Whitfield, it’s up to Katy to unravel her family’s many secrets to save the boy she loves and the town itself from destruction." First line: "I was sixteen years old when I discovered exactly who- and what- I was." Thoughts: When I first read the summary for Legacy, I had to have it immediately. I mean, written in bright pink letters above the summary is "The Darkness is coming"... how awesome is that? Very foreboding! 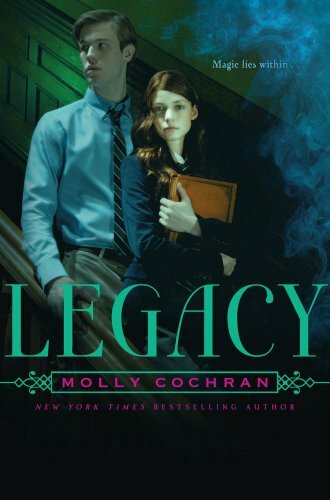 And while Legacy isn't one of my favorite reads, it's still quite a good one. First off, I have to say that magic plus boarding school always equals out to win. The story is about a girl named Katy who's father abandons her at Ainsworth School. Ainsworth nor the town is not exactly what it all seems. And Katy's family legacy lives deeper inside Ainsworth than she could have ever possibly imagined. I really enjoyed Katy's character. She's a genuinely good person and even though the other students and towns people weren't exactly welcoming, she still helped out and was there for anyone when they needed her. I liked watching her progression into accepting her family's legacy and the magic behind it. And I loved that even though other students claimed this or that about her mother, she still had faith that her mother was a good person. Additionally, I'd like to add that I loved her power of viewing past events by touching certain objects. Those were probably my favorite scenes. Interesting indeed! Katy's grandmother and aunt were also a hoot. It's sweet how they constantly told Katy about how Ainsworth women always married for love and followed their hearts, even if it ended up in tragedy. They also loved Katy and accepted her immediately as one of their own, though her father spent years keeping Katy away from them. I love books with a good family behind them, and that's what Katy's family and even Hattie offers it's readers. Now, let's talk about Peter. To be fair, I truly believe plenty of girls will easily fall for Peter. He's the brooding type, with a kind heart at his core. Personally, I found him to be a little bland. It just seemed too typical that he hated Katy (for all the right and wrong reasons), but couldn't help his attraction towards her. What these attractions were based on, I have no idea. It was insta-hate-love, if that makes sense. Hate-love at first sight! While the story was interesting, the romance between the two fell a little flat. The chemistry between them didn't leap through the pages, so I never really felt it. Also, in the beginning, the pacing went by extremely quickly. I flew through the first 100 pages without even realizing it. Then, somewhere in the middle, where the story should have been more intriguing and mesmerizing, it kind of deflated. The story began to feel a little repetitive. I would have liked to see more action, especially when it came to the Darkness. Plus, the story also became a little predictable. Sure there were a couple shocking revelations, but mostly, I saw a lot of things coming. Overall, I was pleasantly surprised by Legacy. It's a fun new witch series to add to the YA community. I very much look forward to reading it's sequel, especially after reading the epilogue. Molly Cochran truly is a fantastic story teller and I can't wait to see what she has in store for us next! I did not like Peter either; he goes from hating to loving her so fast and it just shook me. Also agree about the action being repetitive; I think some more pruning of pages could have been done. Great review! I was really curious about this one but all the reviews i've seen so far have only been so-so. Too bad it had a great premise!! Doesn't really sound like a book I would like but judging by your review I might reconsider checking it out. Great review.